Oriental lilies were developed from just a few different species native to Japan, according to B&D Lilies. 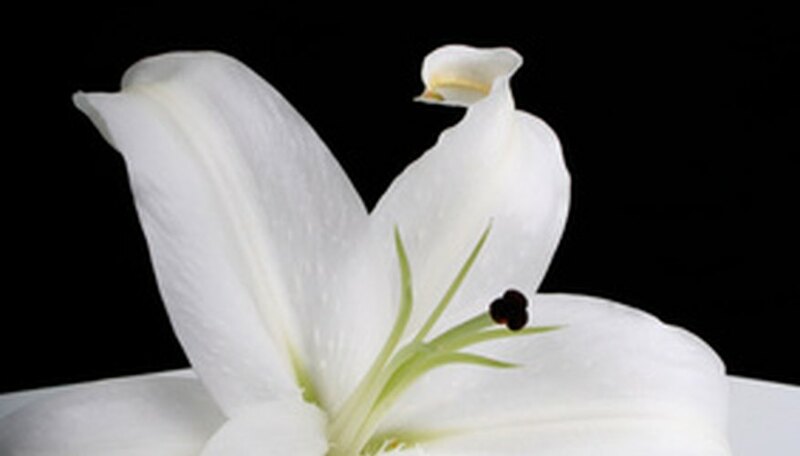 The flowers are larger than Asiatic lilies and heavily perfumed. Asiatic lilies bloom over a longer time period and in more colors. Oriental lilies tend to grow taller year after year and exhibit increasingly prolific blooms. Choose a sunny spot for oriental lilies. They will grow spindly with fewer blooms if they don't get enough sun. Six to eight hours of sunlight is ideal. If you live where the summers are hot, the lilies appreciate afternoon shade. Plant the oriental lily bulb in heavily enriched acidic soil. If you're not sure if your soil is acid or alkaline, purchase a soil-testing kit. If the soil is alkaline consider keeping your lilies in raised beds or containers with potting soil. Dig at least 12 inches into the ground and add a 4-inch layer of organic matter. Turn the soil over and rake it smooth. Plant large bulbs 4 to 6 inches underground, with the pointed end of the bulb facing upwards. Plant in either fall or spring. Before planting, add 3 handfuls of organic matter and a sprinkle of slow-release fertilizer per package directions. Mix in with the soil at the bottom of the hole. Group the lilies in threes and fives, spaced 5 to 8 inches apart. Plant potted lilies in the spring and throughout the summer. The soil level in the garden should cover the soil in the pot by no more than 1 inch. Most potted lilies come in groups of three bulbs to one pot. It's risky to try to separate the bulbs while they're actively growing. Wait until the leaves have died back and then dig up the bulbs and separate. Stake oriental lilies. It's a good idea to place the stake when you plant the bulb. That way you don't have to worry about injuring the bulb by piercing it with the stake later. Fertilize with a food formulated for flowers rather than grass or vegetables. Follow package directions. Mulch heavily with 4 to 6 inches of mulch before the first frost in the fall. Cut no more than one-third of the stem if you want to cut lilies for bouquets inside the house. Do not remove leaves or cut back the stem until it is completely dead.